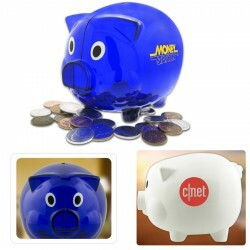 Promotional money boxes make creative branded gifts for clients. 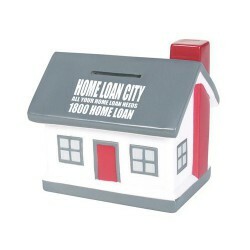 For businesses in the finance industry, these custom made money boxes leave no doubt what you are involved in. They are undoubtedly charming and practical and can be given away during product launches or marketing campaigns in schools and communities. 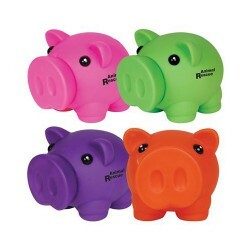 Promotional Product Experts offer many choices of branded money boxes in different shapes and sizes, including pigs, cows and houses. Simply printed with your custom artwork or logo and convey your brand message. Call us for more promotional ideas! 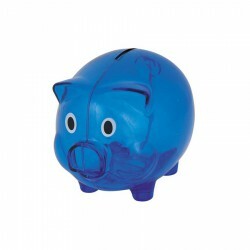 PVC Pig coin bank with removable bung in base. The cutest saving pig you ever did see. Moulded from flexible PVC (almost unbreakable) female torso with screw off bung at base. Perfect for charities, awareness, banks, financial institutions and any company with a message about saving. White man shaped coin bank, coin release at back. White stackable cube coin bank. Bung on base for coin release. Monkey shaped coin bank. Flexible PVC with screw off bung in base. Flexible PVC World map coin bank with raised countries. Bung at base for coin release. Homely money bank with large branding areas. 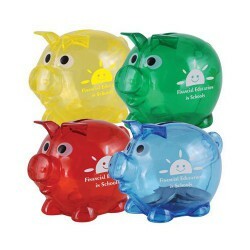 Translucent piggy bank with large branding areas. 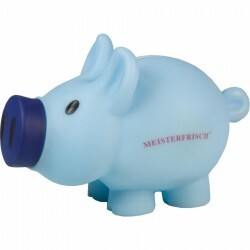 Cute plastic and rubberised piggy bank with screw on nose. 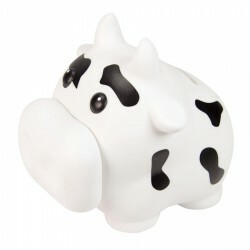 Save money with this lovable moo cow bank! Polystyrene plastic coin bank. Removable coin release bung at base. Bright piglet savings bank. Moulded from flexible PVC with screw off nose cone. Percy Pig is one cool dude. 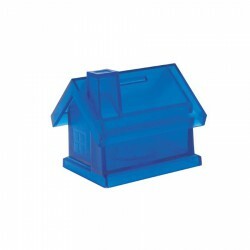 Moulded from almost unbreakable PVC with removable nose cone for easy coin release. Colour changes can be made to Percy's clothes as little as 3,000 units up and 5,000 units up. Percy can be reconfigured with polo shirts, sports attire, racing attire, hard hats, overalls & football jerseys in a multitude of colours (mould extra). Flexible PVC with removable nose cone for coin release. Flexible PVC with screw off nose cone for coin release. Moulded from flexible PVC (almost unbreakable) with screw off bung at base.